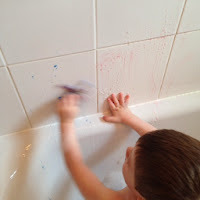 I'm always on the look out for activities to do in the bath or out in the paddling pool in the summer, primarily because I don't like too much mess and I love that bath play can be slightly messy and I don't get anxious about it. I don't often buy things from Avon as I prefer to buy more natural and cruelty free products but when I saw these bath paints I thought I'd get them for part of T's Easter gift. 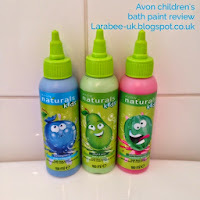 I bought these bath paints at £1.50 each, but they are now down to £1.25 on the Avon website if you are interested. We started off by drawing 'tattoos' on T! He has very sensitive skin but these paints didn't affect him at all, the colours are really deep and not at all wishy washy. My only (slight) criticism was that I really struggled to squeeze out the paint, there's no way T could do it, which in all honesty wasn't a bad thing but I do think that this could lead to frustration after a few uses. I then gave the paints a bit of a tile test, again the colours were bright and they smell fresh and fruity, it was difficult drawing with the bottle though. 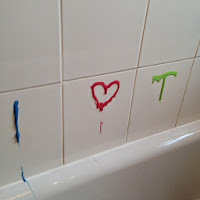 The green T above was actually drawn on a wet tile and as you can see the paint stuck really well, even after 5 minutes there werent too many more drips than were there initially. 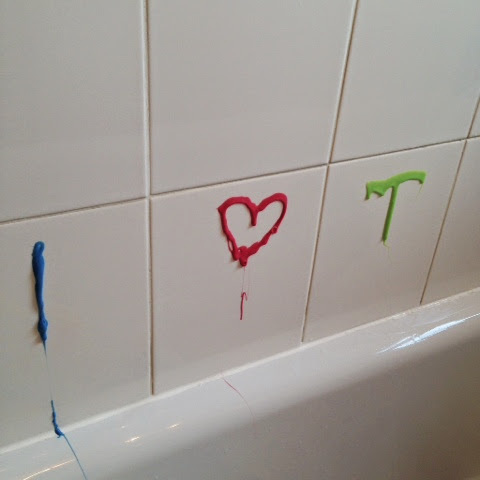 Then the moment of truth came... would the bath paint stain the grout? I always get a little nervous at this time because although it's only grout and can easily be refreshed it would be a pain in the backside to have to do it! I'm really pleased to say that clean-up was a breeze, even though when we wanted it to stick, it did, when we wanted to wash it away, it came off effortlessly. Even T managed to clean the titles within minutes with no trace of the paint at all. Overall I've been really pleased with this product and will definitely buy again and as you can imagine they were a huge hit my 2 year old T, we'd both highly recommend these. I should point out that I have received no financial reward for this review, all opinions are my own and I am in no way affiliated to Avon.